Ross sapote (Pouteria sp.) 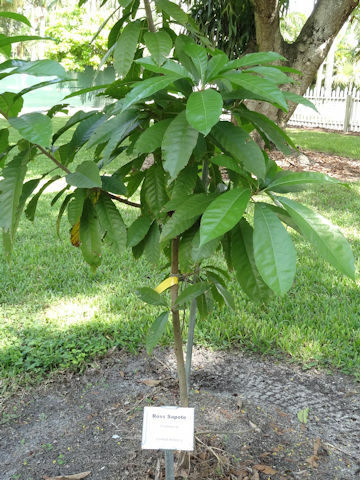 belongs to the Sapotaceae (the Sapote family). It is a small evergreen tree that is native to Central America. Ross Sapote may be a variety of Canistel or a close relative. The fruit grows more in clusters and is smaller and rounder than the larger selections of canistel. It has an orange-yellow thin skin, flesh is moist, resembling a hard boiled egg yolk. It is eaten fresh, it is used in cooking, pies, and ice cream.